4A Games says it will unlock FOV in the next Metro: Last Light patch but warns that messing with it could have some unexpected results. 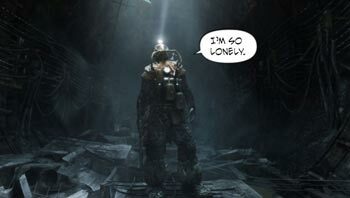 Metro: Last Light seems to be doing quite well for itself with both gamers and critics, but one complaint to emerge from a certain number of players is that the FOV - that's field of view - is locked. It's not an issue for most people but FOV enthusiasts take the matter pretty seriously for a number of reasons, most commonly that the default field of view can cause varying degrees of motion sickness. The general feeling is that since it's not a big deal to add an FOV slider, every FPS should have one; but 4A Games says it's actually not quite that simple. "The main reason for maintaining a fixed FOV is because we have 3D elements like the watch and weapon ammo that need to remain visible. In addition, all the game's first-person cut scenes and cinematics and each and every animation involving Artyom's hands - idle weapon animations, reloads, ladder climbing, melee attacks etc, - were created assuming the same, fixed field of view," the studio explained in a Steam forum post. "Changing the FOV would break all the cut-scenes and animations - you would be able to see inside Artyom's arms, or they would appear to float in the air in front of you. Or worse." The team had considered including three FOV presets in the game but decided against it because of the significant amounts of work involved for less-than-ideal results and the detrimental impact on performance caused by the increased amount of geometric detail in a wider field of view. But now, acknowledging that this is a bigger deal than expected, 4A says it will give players what they want - for good or for ill.
"The next title update, due in the next few days will allow you to directly change the FOV in the .cfg files," the studio wrote. "This may well trigger a number of issues listed above - you have been warned!" That's not necessarily the end of it, however: 4A described this as an "immediate term" fix while it looks at other possible solutions which will presumably also allow FOV adjustments in the console versions of the game.